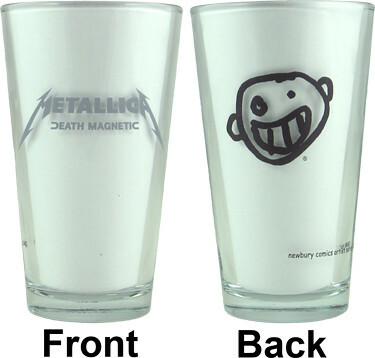 If you pre-order METALLICA's new album, "Death Magnetic", from NewburyComics.com, you will receive a limited-edition pint glass (see photo below) from the "Newbury Comics Artist Pint Glass Series" (while supplies last; only 1,500 glasses will be made). A five-minute audio file containing 30-second samples of all 10 tracks that are set to appear on "Death Magnetic" is available for streaming below. METALLICA has officially set Friday, September 12 as the "worldwide" release date for "Death Magnetic". The CD will be available to download for Guitar Hero III: Legends of Rock on the same day the album arrives in stores. The band is offering the record for sale in numerous configurations, ranging from a digital-only release to a deluxe "coffin box" that will come with a bonus CD, a DVD, a T-shirt, guitar picks and other goodies. METALLICA will play two budget-priced shows in London and Berlin to launch "Death Magnetic", including the opening show on September 12 at the new 17,000-capacity O2 World arena in Berlin. METALLICA also plays London O2 arena on September 15, with tickets priced at £5 ($9), according to Billboard.com. Proceeds from both shows go to local charities. The concerts will go on sale to registered fans only with tickets priced €10 ($14).